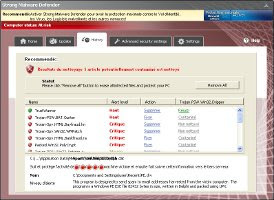 Strong Malware Defender is another fake antivirus software. It reports false infections and displays a lot of fake security messages in order to trick you into purchasing its so-called full version. So, don`t trust anything that this software will say you and uninstall it as soon as possible. The malicious application is distributed with the help of trojans that come from various misleading websites. When the trojan is started, it will install this malware. On first run, Strong Malware Defender configures itself to start automatically when Windows loads. Next, the fake antivirus will simulate a system scan and list a lot of false infections that actually does not exist! Strong Malware Defender will state that your computer is infected with adware, trojans, worms or malware with one purpose - to scare you into thinking that your PC in danger. Obviously, such results are a fraud, so you can freely ignore them. The rogue uses the false scan results as method to trick you into purchase the full version of the software. However, all the above alerts are totally fabricated and must by no means be trusted. The rogue generates these messages only to scare you into paying for this scam software. Thus, like false scan result, you should ignore all of them. As you can see, Strong Malware Defender pretends to be a legitimate antivirus software but, in reality, it is a scam. You should remove this malware as soon as you notice it installed on the system. Please use the Strong Malware Defender removal steps to remove this malware from your computer for free.